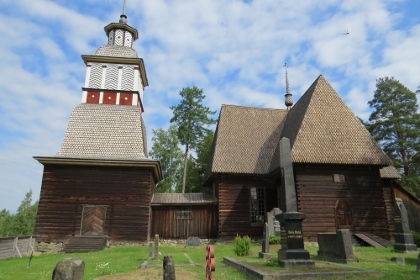 Petäjävesi Old Church is an 18th century wooden church that exemplifies Scandinavian Lutheran church architecture and the long tradition of log building in Scandinavia. The design was influenced by European architectural trends such as Renaissance and Gothic, which were combined with the vernacular technique of log jointing. The church was constructed between 1763 and 1765 as a small village church, because the trip to the parish church in Jämsä took too long. Petäjävesi church was built on a peninsula, where two lakes meet: so the congregation would reach it by boat (or over the ice in the winter). The bell tower was added in 1821. The church was abandoned in 1879 for a new church. In the 1920s the Austrian art historian Josef Strzygowski noticed the architectural and historical value of the church and since 1929 it has been restored several times. 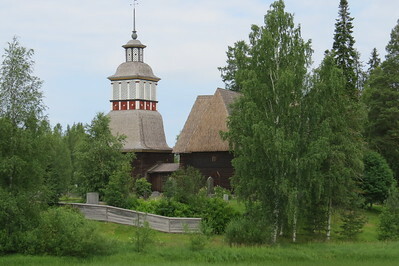 Our luck with Finnish summer weather ran out the day we planned to visit the wooden church in Petajavesi. It was pouring when we got into our rental car, and we almost decided to skip the 1.5 hour drive north from Tampere. But you have to show stamina when collecting WHS, so off we went! The church turned out to be very conveniently located next to the big road between Keuruu and Jyvaskala. 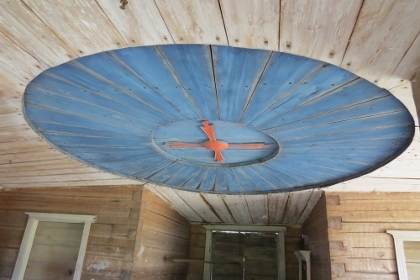 You can't miss it, because it's rather large and has a romantic setting next to lake Päijänne. The exterior is not unlike the Urnes Stave Church that I visited a few years ago. Both are wonderful buildings in a spectacular natural environment, so I wouldn't prefer one above the other. We arrived at 10 on Sunday morning and received a friendly welcome. A ceremony in front of about 20 locals had just started. A solemn protestant service it was. That gave us time to glance at the sturdy woorden interior design of this church. We didn't stay too long however, and quickly headed to the other side of the street for a warm cappucino in the gas station annex bar/restaurant. My second visit (in 2013) fortunately was in much better weather. I was surprised by the quality of the church, it really is eye-catching when you walk to it. I now had the chance to have a better look at the church's interior, with its wooden pulpit as the shining star. 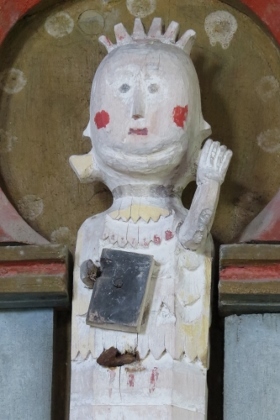 The colourful carvings depicting the apostles and angels have a somewhat naive expression. The site has become a popular tourist attraction for sure. I arrived at the opening hour of 10 a.m., and I had to share space already with a bus load full of American students and some other individual travellers. There's an entrance fee charged of 5 EUR. After Petäjävesi I drove on to look for some more "Wooden Churches of Central Finland". 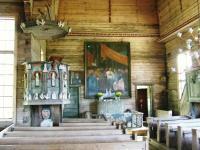 I visited two other very pretty 18th century examples: the Old Church of Keuruu and the Pihlajavesi Wilderness Church. We visited Petäjävesi on an overcast day in early July, as part of our tour around southern and central Finland. This really is a very small site, just the church and it's surrounds. We've seen lots of small wooden churches now on the World Heritage Journey, in Slovakia, Poland, Romania, and neighbouring Norway, and this one felt quite similar as well. It dates from around 1765 and is almost entirely original from that time, although the bell-tower is a later addition. Inside there's some fascinating carvings and decorations that are excellent examples of vernacular art - just local artisans doing their own thing, so they look quite unusual and eccentric, particularly the large carvings of Jesus and the apostles. Although it was out of service for over a century, these days it's an active church with services every Sunday, and is a popular wedding venue as well. It's generally only open during the summer months - dates and times can vary so check the official website for details. And of course it's closed while services are happening. I reached Petajavesi by train on the line connecting Vaasa and Jyvaskyla. Even the station is a picturesque old wooden building. A short walk away is the old church, one of the nicest I have ever visited, for its architecture and the skill displayed in its construction. The interior is very plain; apart from a large painting and some coloured wood carvings around the pulpit it is all natural wood. But the exterior cladding and the tower are magnificent. 3.0: Els Slots Ivan Rucek Juha Sjoeblom Tony H.
ICOMOS to provide more exhaustive study on this monument's "Universal Value"
Falun Red: The lower timber walls and part of the bell tower are painted with punamulta / Falun Red. The paint is also used for the inside decorations.